This is the 397th Thanksgiving - Celebrating it began in 1621. However, President Abraham Lincoln declared the last Thursday of November Thanksgiving, and it became a national holiday in 1863. 53 colonists and 90 Wampanoag (Native Americans) attended the first feast. 45 million turkeys will be consumed, and 80 percent of Americans will eat turkey this year. The average weight of a turkey is 17 pounds. Males tend to weigh more than females and can weigh up to 25 pounds. The biggest turkey ever weighed was 86 pounds! For those of you avoiding the stress and mess that hosting this holiday may bring, check out Franchise.com’s food franchises. And for those of you who would like to prosper from the 32 million people going out to dinner this year, consider opening a food franchise yourself. 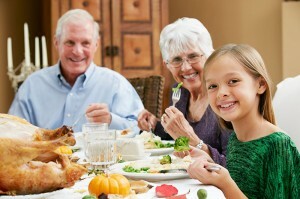 Happy Thanksgiving from all of us at Franchise.com! Marketing Coordinator for Franchise Solutions and Franchise.com; conduct email marketing campaigns, web page management and trade show coordination. Mother of two, wife and Young Living Essential Oils representative. Are You Cut Out to Work From Home?